The Acoustic Camera from Polytec is the optimal tool for measuring and visualizing sound level measurements. This system can be used for sound source localization on targets that are outdoors, stationary, in wind tunnels or moving, by taking real time measurements and displaying them as 3D acoustic fields. Sound sources can be resolved just as easily on both small devices and large awkward structures, made possible by the 3D functionality and ultra-high resolution of the Acoustic Camera. These measurements are performed very quickly. 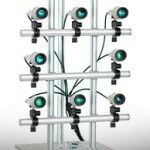 The modular and flexible architecture of the instrument allows the system to analyze the structure rapidly. Measurements are visualized and quality problems resulting in greatly reduced development effort and time. Passenger interior - visualizing pass-by noise from an empty tank wagon and passenger train cabin.